Medieval agriculture was undertaken in open fields where each peasant had traditional rights to grow and harvest crops in strips. The fields were “open” in the sense that they were not enclosed by hedgerows, but there was in no sense a free-for-all. Strips of land were passed down through generations, usually on payment of an entry fine. Thereafter the peasant was entitled to make use of the land and everyone knew where the boundaries were. Some peasants had acquired more land rights than other over centuries and some were landless labourers working for day wages. Sheep and cattle were driven out to graze on “waste” (land that was hard to cultivate), sometimes known as common land. Common rights were critical to the peasant economy; without them it was hard to maintain livestock. The Tudor period witnessed the beginning of land enclosures which continued to the 18th century. What we now see as a familiar pattern of fields and hedgerows in the countryside was developed during these centuries. In the 16th century common rights were held by all the residents of the manor, that is the inhabitants of the village of Wolverton and outlying cottages and the fifty or so dwellings on the east side of the Watling Street. The enclosures began in a tentative manner. Sir John Longueville enclosed 10 acres around Bushfield School in 1530 and his son Thomas enclosed 32 acres called the Dickens, but revoked the action on his deathbed. In 1541, Arthur Longueville, then the inheritor promptly re-enclosed the land and in 1554 enclosed another 50 acres in the Stacey Bushes area. However, he also relented and re-opened the field. His son, Henry, was more determined. In 1566 he enclosed those lands that had formerly been enclosed and in 1579-80 enclosed a 158 acre tract of land known as the Furzes. These combined actions took some 250 acres out of common usage. The local population at first responded by pulling down the fences. Henry Longueville retaliated by hiring ruffians to beat up the objectors and sometimes to kill their cattle. Local justice was not much use here, as Sir Henry Longueville himself was the Justice of the Peace, so the inhabitants of Wolverton and Stony Stratford petitioned the Lord Chancellor in 1584. Three men had the courage to sign thee petition, Thomas Furtho, John Hinders and Christopher Carne. It appears that their complaint was upheld, although it is not clear how it was enforced. The final phase of the enclosures occurred around 1654 when Sir Edward Longueville was Lord of the manor, chiefly, it seems, under the instigation of his wife Margaret. We should perhaps bear in mind that the Longuevilles were at the time in somewhat straitened circumstances due to their heavy committment to the royalist cause in the Civil War and may have acted with more ruthlessness than they might have in more affluent times. Not a bit of this mitigation would have impressed the villagers who were uprooted from their homes, and in many cases from their livelihoods. There was probably some compensation, although this is unrecorded, and was probably little enough. Some may have found employment on the manor for low wages, but many would have had to find new ways of making a living in (probably) Stony Stratford. Dame Margaret’s name was infamous in the popular mind. The location of the ancient settlement can still be seen in the field beside Wolverton Park. I have a post about it here. Enclosure meant exactly that. Hedgerows were planted to mark off the fields and separate cattle and sheep from arable land. 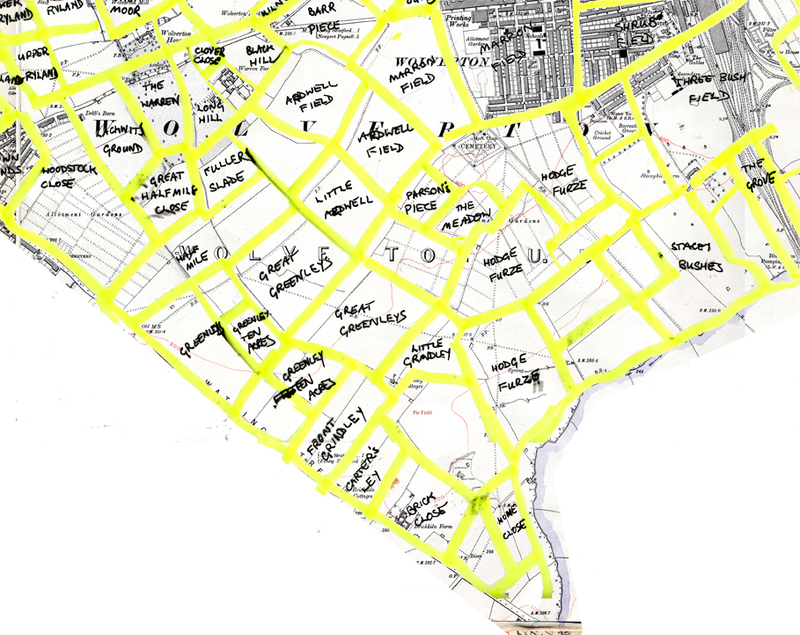 Dr. Francis Hyde published a map of these fields, together with their names, in his A Short History of Wolverton. I have discussed these names (some of which are very old indeed) in these posts. It has been estimated that there were about 30 families still living in the old medieval village in the middle of the 16th century. However, by 1654, when the Longuevilles completed their objective of enclosing the entire manor, the village had ben totally depopulated. While the de Wolverton family were in decline, the de Longueville family were on the way up. Maigno le Breton, founder of the de Wolverton line, had acquired large estates after the Conquest and was assessed at 15 knights’ fees in service: that is he had fifteen knights under his patronage, each of whom would have had a manor or part of a manor to support himself and his family and indeed his ability to arm himself for potential combat – no mean expense. The de Longuevilles by contrast appear to have started their life in England as knights but initially without any grant of land. They emerge on the record in the 12th century, a century after the Conquest in the Manor of Overton in Huntingdonshire, part way between Oundle and Peterborough. The manor only has one entry in the Domesday Book of 1086 but the holdings are shared between Eustace the Sheriff and the Bishop of Lincoln, Eustace having the larger share. This quite large manor was divided into two which later assumed the names of Orton Longueville and Orton Waterville after the dominant families of the 13th century. was subinfeudated, possibly by 1135, to Roger and John, both “men of Eustace”. One or the other may be the ancestor of the de Longuevilles but there is no documentary evidence to make that connection All we know is that the de Longuevilles hold this manor as one knight’s fee to the Lovetoft barony. The Lovetoft Barony appears to have comprised the holdings of Eustace the Sheriff although in the murky world of 12th century records any lineage with Eustace is unclear. This information does at least help us to place the de Longuevilles. Their heritage was modest but over a period of centuries they appear to have established themselves as a middling rank family with some landed resources. The Orton Longueville family emerges with Henry who held the fee in 1166. Henry had at least three sons of record but his heir was Reginald who died before 1219. His son John became the tenant and he died before 1265 leaving one son Henry as a minor. In the practice of the day Henry became a ward until he became of age, under the protection of his overlord Roger de Lovetoft, who was then able to enjoy the revenue from the manor. However, Henry was able to advance himself through marriage to Roger’s daughter Petronilla. 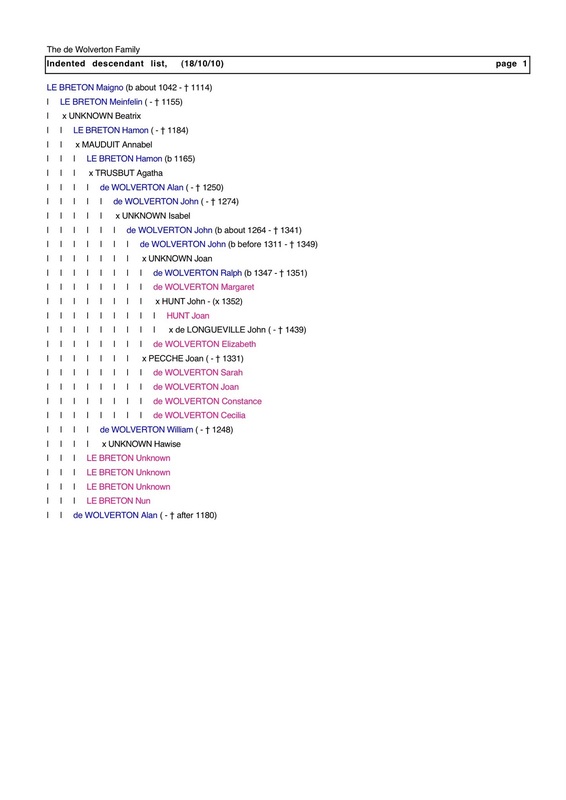 Some genealogists have tried to connect these Longuevilles with the great magnate, Walter Giffard de Longueville. In the first place there is no actual evidence for this and in the second it is highly improbable that any descendants of the great man would languish in the lower ranks of knighthood. This connection appears to have originated with a book published in 1741 and may indeed have originated from the family itself in an attempt to burnish their lineage. Unfortunately more than a few amateur genealogists have repeated this error. Exactly how and why part of the family moved from Orton to Little Billing is unknown. What we do know is that a John de Longueville acquired the Manor in 1301. He may have had land there prior to this because he gives some land in Little Billing to St John’s Hospital in Northampton. Later in 1323 he founded the Austin Friars in Northampton. He is not the John de Longueville who inherited Orton Longueville from his parents, Henry and Petronilla and who died in 1316 and he is not directly descended from Henry and Petronilla. It is possible, and even likely, that he descended from a younger brother of Henry and therefore both Johns share a common grandparent. In the 14th century there were three, possibly four, ways to acquire land – through inheritance, though marriage and through service. The fourth possibility, through direct purchase, cannot be totally ignored, but in this case is less likely. The Longuevilles of Orton do not at this time appear to be that wealthy. The facts that we do know is that the title to the manor was transferred (alienated to use the terms of the time) to Sir John Longeville in 1301 and there was a so-called foot of fine to put this on record. The rather odd name comes about because these transactions were usually recorded on a single sheet of parchment, on which three copies of the deed were made – one on the left, one on the right and one at the foot. Each part of the document was cut with wavy lines so that the originals could be matched without forgery. The two parties to the agreement kept the right and left hand copy and the court retained the foot.. They are called fines because the agreement was a final concord – fine for short. Thus the court records, which are in most cases the only surviving records, became known as feet of fines. The Manor of Billing was part of the barony of Winemar the Fleming, the same man who held Hanslope. The descendants of Winemar, who took the name Preston, after Preston (Deanery) which they also held, appear to have run out of male heirs and in 1284 it is was in the hands of the widow Alice de Preston. What happens after that is unclear but Longueville may have come into the Manor through marriage to one in the female line of the de Prestons. We know from record that Henry was put into wardship as a minor. He was the heir and there were estates to manage. 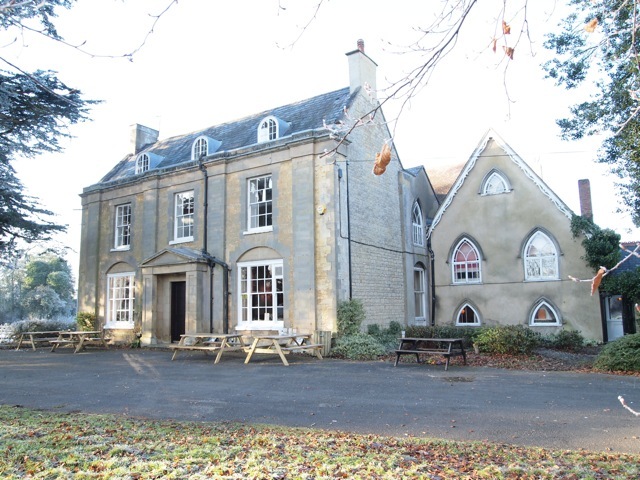 A younger son with nothing to inherit may well have been given over to the custody of a related family and it may have been this that brought the young John to Little Billing. There will have been no need for any record, which is why we have none, but he must have acquired some wealth somehow, possibly through a will from his relative but if no feudal holdings were involved there would be no need for royal intervention and a local deed would have been sufficient. We must assume that this was lost. The 18th century genealogy traces the later Wolverton Longuevilles from a Thomas Longueville of Little Billing. The precise relationship with the John mentioned above is not a matter of record. He could have been a son or grandson He married Beatrix Hastings and they had at least one son, Thomas. This Thomas married Isobel. And he died in 1361. They had a son John and his son, also John was the one who married Joan Hunt and thereby came into the Wolverton inheritance. The de Wolverton line, as we have seen, produced no male heirs after the death of Ralph de Wolverton, then only a boy, in 1351. At this point the great Barony of Mainou is broken up. Chalfont St Giles and Padbury were settled on the four sisters of John de Wolverton’s first marriage and Wolverton and Wyke Hamon (Wicken) divided between Ralph’s elder sisters, Margaret and Elizabeth. Margery outlived her first husband, then a second, Roger de Louth and a third, Richard Imworth, but not the fourth, John Hewes, who after 1393 granted his interest to John de Longueville and his wife Joan. This is the beginning of the Longueville story in Wolverton which was to last until 1712. As I work through the Wolverton manor documents I note perhaps the obvious – that most of the land transactions involve Norman names. There is a Hubert and an Osbert, but these names could equally be derived from Norman/Viking stock so that may mean nothing. It looks as if the Norman control was complete by 1250, when most of these documents were written. All members of the intermediate knightly class were at least in part of Norman descent and the old english names had disappeared. English ( i.e. Anglo Saxon) names made a slight comeback when Henry III, a great admirer of Edward the Confessor, named his son Edward, but the rest had to wait for the 19th century when the Victorians rescued such names as Harold, Edwin, Edgar, Herbert, Hubert, Alfred, Ethel and Edith. These names are entirely absent for the Wolverton documents, whereas they are crowded with Alan, Bartholemew, Geoffrey, Hamo, Henry, Hugh, John, Nicholas, Peter, Ralph, Richard, Robert, Simon, Thomas, Walter and William. Most of these male names have retained some currency today after 1,000 years, but a few have disappeared. Hamo, or Hamon, fell into disuse after the 13th century and the first baron’s name, Mainou, lasted no more than three generations. Similarly with Meinfelin. Women’s names occur less often, but some are still around today – Margaret, Sybil, Annabel, Emma, Matilda. Others, like Hawise and Ozanna appear to be extinct. Helewisia probably morphed into Eloise or Louisa. Surnames are a bit more difficult because they were not common until the 14th century. Even the more important people were not terribly fussy about surnames. the first baron of Wolverton was simply Mainou le Breton – which told us his regional origins and nothing more. His descendants waited about four generations before they took the name “de Wolverton”. Many people in these documents start to carry a place name after their first name – Hugh de Stratford, Peter de Bradwell, Geoffrey de Loughton, Simon de Haversham, John de Hanslope and so on. There are a few who brought names from France – William Vis de Lu, William Mauduit, Geoffrey Conterral. Some acquired names from their appearance – Stephen Blundus (Blond) and William Ruffus (red). There are two older names: Robert Race and John Hastengs. Race is a Celtic name found today in variants such as Rhys, Rice, and Rees. Hasteng, which later became Hastings, has nothing to do with the town of that name but is a Viking name, probably a leftover from the period of the Danelaw. Both Rees and Hastenga are warrior names. The Race and the Hastengs families may offer some evidence that the natives were able to integrate themselves into Norman society. You can also see the emergence of a surname in these documents. Matthew le Bule (Bull) was the son of Godfrey of Wolverton. The Bull, possibly a nickname of sorts, may well have progressed into a fully fledged surname. The women of 1,000 years ago are largely absent from the surviving records. Even at the top rank of Wolverton society there are no women of record until the end of the 12th century when Agatha Trusbut makes an appearance as the wife of Hamon, Baron of Wolverton. The same is true of men who don’t inherit. The first baron of Wolverton, Mainou, probably had more than one child, but the only one we know of is his heir, Meinfelin, and this continues for a few generations until Hamon (just mentioned) dies without issue and the barony is inherited by his next surviving brother, William. He in turn dies without issue and the estate passes down to a third brother, Alan. If Hamon and his wife Agatha had surviving children I expect we would not have known about William and Alan. The records that exist concern property, taxes and crime and thus the rules of primogeniture, practised zealously by the Normans, would mean that there was little point in recording the names of younger sons and daughters unless property was in some way involved. Women, children, younger sons who did not inherit, the mass of tradesmen and the peasantry had unrecorded lives – a very distant remove from today when even our grocery shopping is tabulated. Chance records survive. This one for example from the Wolverton Manorial documents in the Bodleian Library. It is dated between 1248 and 1250. Sarra widow of Stephen Blundus of Wlverton in her pure widowhood grants and confirms to Amicia daughter of Richard son of Rand of Bradewell 1 acre in field del Est of Wlverton: 1/2 acre above Rowpittfurlong between her land and that of Amice daughter of Robert son of Rand and 1/2 acre above Depedenehole next land of Rad Mangkorn and abutting above the dole of Robert son of Stephen called Wytherstuuengale and above the land of Hamo Hasteng at Smalewill furlong. It is probably impossible to make much sense of this. The field names have long since disappeared together with the one-time owners, but it does illustrate that widows did have the right to dispose of property and they could, as in this case, grant the land to another woman. It is my guess (and only a guess) that Amicia is her granddaughter and possibly her only heir. Basilia, daughter of William son of Basilia of Wluerthon grants and confirms to Robert Clerk of Stonistratford 1/2 acre in field del West of Wluerthon beyond Lebrodewey between land of Hamo Hasteng and land held by Hugh Mayheu. Service, and 7s gersum. 1d per annum rent. This deed confirms that land could be owned and disposed of by women and also, after almost two hundred years after the Conquest, little parcels of land had been granted, divided and subdivided amongst many different people. 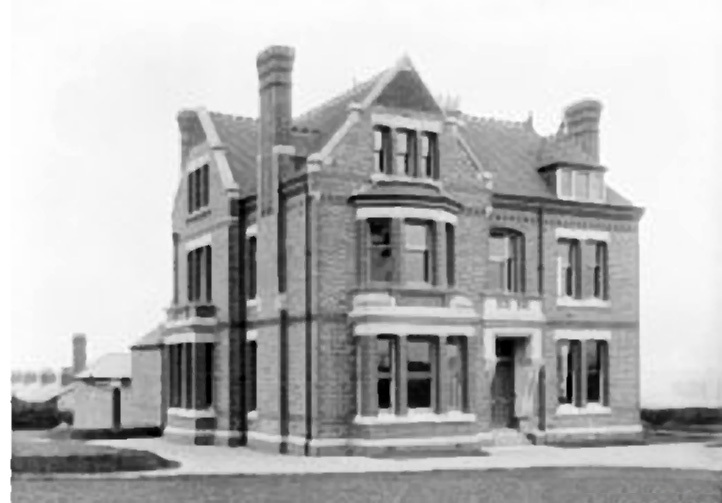 The “gersum” was a premium paid by the tenant on taking up the holding. The rent for this half acre was a mere 1d a year. 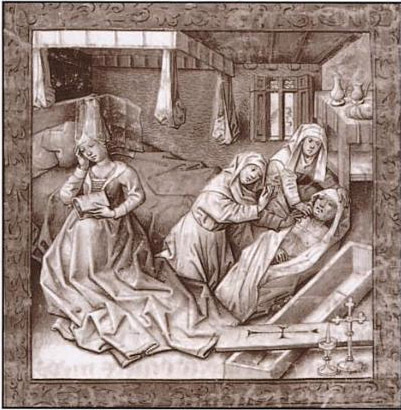 Clearly a woman who made the most of life and was, by the time she comes to Chaucer’s notice, a woman of some wealth. But women were constrained. They were not judges or surgeons and their lives were largely defined in the context of men. Widows were often pressured into re-marrying and single women had very little status. Women of a certain class could elect to go into a nunnery, often to avoid re-marriage or marriage altogether. Women from the lower orders could be accepted into nunneries but only to do the hard menial work.